Skip the Donut, Fry an Apple! | Delicious! Delicious! Skip the Donut, Fry an Apple! Giant tents can be seen from quite a distance on the flat, Southern landscape. Dozens of WORKERS unload heavy, shiny lights from their big-rig trucks. Other FOLKS mill about a couple of steamy, catering trucks, discussing the day’s workload over their cups of coffee and donuts. Caryn has already made the new kitchen her home. She stands comfortably over the small stove, dropping rings into oil bubbling madly in her cast iron skillet. Mr. R. lounges on the couch, script in hand and a napkin tucked into his shirt collar. I can’t believe you brought an iron skillet all the way across the country. I would’ve shipped it, but I didn’t know where we were going. I’m still not quite sure where we are. Me neither. All I know is that there isn’t a Starbucks in sight and Lauren has been on a latte-deprived rampage all week. Caryn winces at the thought as she drains the rings. A timid knock sounds at the door before it is cracked open. The very young, shy SECOND SECOND ASSISTANT DIRECTOR peeks her head in. Mr. R.? I think they’re ready for you in make-up. Mr. R. rolls the script up under his arm and walks over to the girl in the door. She is clearly enamored with the star. Caryn piles some crisp, doughy apple rings onto a napkin. Wait. Take these with you! Ah! Perfect. Beats the heck out of craft services. The 2nd 2nd looks at Caryn in wonder, but is afraid to speak. The pair heads off down the row to find another trailer. A couple CREW MEMBERS wander by nonchalantly, but as Mr. R. passes, they can’t help a quick glance back. The tartness of a Granny Smith apple will cut through the cakey dough. The batter isn’t sweet, so you might want to add sugar. Or use a sweeter apple, like a Golden Delicious. 1. Combine flour, baking powder and salt. Cut in shortening with a fork or two knives until crumbly. Add egg and milk. Whisk until batter is smooth. 2. Heat 1/2″ of oil in large, heavy-duty skillet until hot enough to fry. Test by dropping a tiny dab of batter into oil. If too hot, batter will burn before apples are cooked, so adjust temperature accordingly while frying. 3. Cut apples into 1/4″ slices. 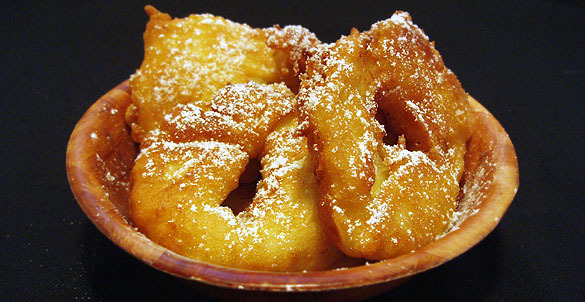 Dip apples into batter until well coated. Drop into hot oil. Fry until golden and apples are cooked through, about 2 minutes each side. 4. Drain on paper towels. Sprinkle with sugar just before serving. Yield: About 2 dozen rings. These sound so delicious. I love your site (it’s one of my favorites) and think you are fantastic. My question for you is: how can I get a good cast iron skillet? I’m wary of buying a new one, even a preseasoned one because I wonder if it might be too new to be good. At the same time, I’m wary of buying one on Ebay because what if it is all nasty or rusty? So I’m not sure where to turn, unless I abscond with my mother-in-law’s… Help! Please. Hi Caryn! I just wanted to leave a note letting you know I am madly addicted to this site. I love everything about it – the recipes, the gorgeous photos, and the storyline. Thanks for doing this!! Laura, I just received my cast iron skillet last year and now use it for about half the things I make. I chose the Lodge Logic pre-seasoned 12″ skillet with assist handle (very important because the darn thing is heavy!). Every once in a while I have to reseason it because I’ll cook something acidic in it or do something stupid like that. But on the whole, I’m wonderfully happy with it. The skillets are pretty cheap, so I found that all my deliberation wasn’t worth the effort. Lodge makes a pretty good line. You can buy a used one, which a lot of people like to do for the heirloom sentimentality of it all. If it needs reseasoning or is rusty and crusty, scrub it down with a steel pad (no soap) until the rust and crud is gone. Reseason it by covering with a thin layer of shortening and then baking in a 350 degree oven for an hour. Then turn oven off and let it cool completely. And throw some foil under it to catch any drippings. You may need a second coat if you really had to scour it. Either way, cast iron is cheap and easy. I’m thrilled with my skillet and recently received a Dutch Oven to match! Yippee! Jane, THANKS! I am so glad that you like the site. It makes me happy to know someone reads it!! Mmmmm…these look delightful. I’ll have to give them a try some weekend- I’m sure the kids will be thrilled! I can’t resist sneaking a peek at your site EVERY DAY. I am a faithful fan. I pondered the riesling salad this weekend but made my kids their first ever jello/fruit salad, instead – they, of course, adored it. Will have to try to the adult version. I’ve had great luck with used iron cookware – it’s just the type of kitchen ware people get rid of at yard sales. I’m having a difficult time picturing Mr. R. Will you divulge any distinguishing features? Another fan adding her voice to the crowd! I’ve just spent the last little while eagerly gobbling up your archives. I have a cast iron skillet and a dear boyfriend who loves all things apple … oh the possibilities. I have spent the last day and a half going over every single archive. I love this site and have it in my favorites, I will check it out everyday, I can’t wait until the next page in this very interesting story. I agree with Amybee, please give us a little more to go on with Mr.R. Does he have dark hair, blond? Tall, lean, muscular? how old? What is his smile like? Does he smile? Throw us a bone here! Also, love the recipies, I read cookbooks like most people read a book. It is great when you can read a recipe and understand the flavors that mingle together to create something wonderful. Great pictures too. Thanks. Obachon, you can use any kind of apple really. It’ll just be sweeter. Pinepple sounds great, Helen! Will have to try that! Thanks, Moira! I’d sweeten the batter a little for kids…add some sugar. Or be generous with the confectioner’s sugar. Okay, AmyBee and Leannwoo. Since you twist my arm, I’ll consider adding a few more details about what he looks like. Thanks so much the encouraging words! Love this site and the pics! Thanks for the posts.